Since becoming a full fledged vegan (about 2 years ago) I haven’t had a good pizza, why not give a vegan one a try! I love sweet potato so it wasn’t an accident that I chose this as my main ingredient for the crust. Another favorite food of mine is sun-dried tomato pesto. Instead of traditional pizza sauce I made a tomato based pesto sauce. This is my attempt at a Sweet Potato Pizza with Sun-dried Pesto Sauce. As you know traditional pizzas are topped with full fat cheese and meat toppings, I went for fresh vegetables and no cheese! These included, peppers, red onions, kale and asparagus. You can add your own favorite toppings to make this “your” pizza. 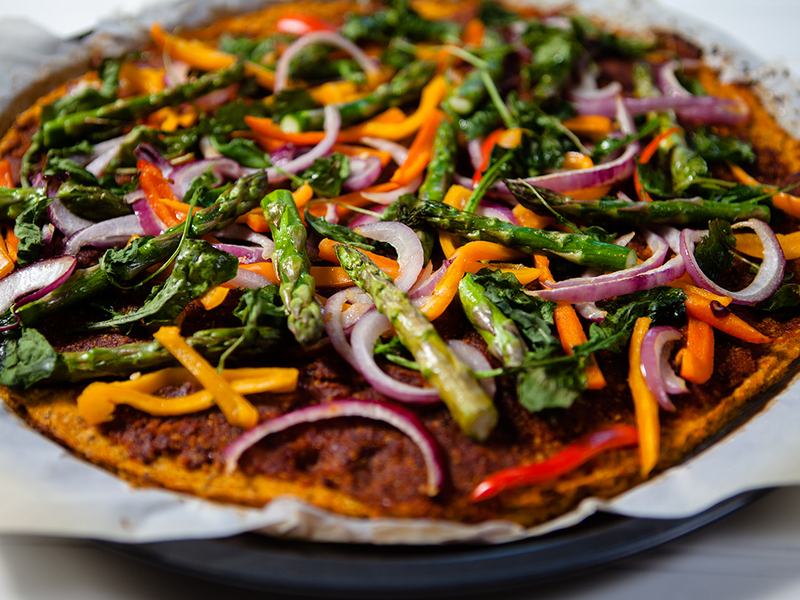 You may even opt to use a vegan cheese to give your pizza that traditional look. 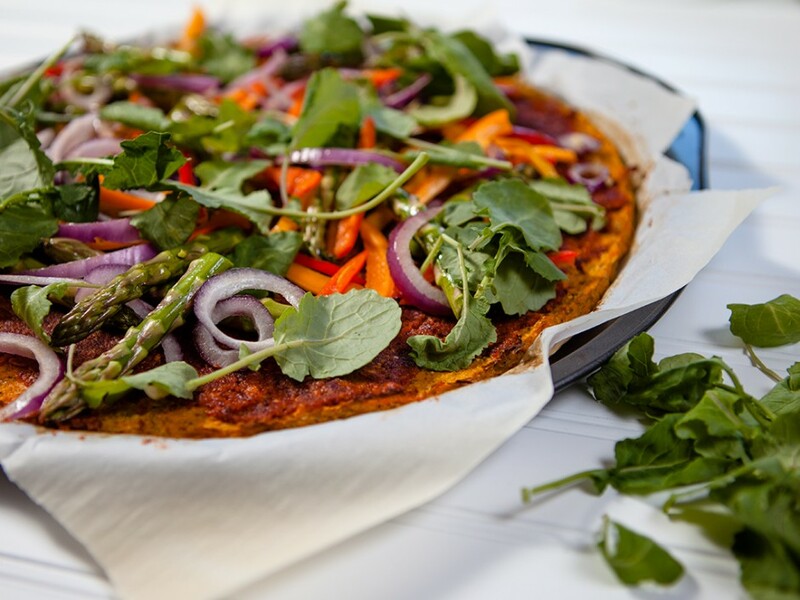 There is a fair amount of prep work when making the crust for this pizza so be warned! The pesto however only takes around 5 minutes. Remove pizza from oven and spread prepared pesto sauce on the crust. 1¼ cup oat flour or make your own by processing oats. In food processor pulse almonds with garlic until coarsely ground. Add tomatoes salt and pepper pulse till finely chopped. With motor running add oil I thin steadily stream until smooth. Steam the sweet potato cubes in a steamer or over the stove for 30 minutes or until fork-tender. Add the chia seeds and water to a small bowl, whisk with a fork, and let stand at room temperature for 10 minutes to create a chia egg. Add the steamed sweet potatoes to a large mixing bowl and mash them. Add in the chia egg, oat flour, almond meal, olive oil, apple cider vinegar, basil, oregano, garlic powder, sea salt, and chili flakes. Stir together until combined. Line a round pizza pan with parchment paper. 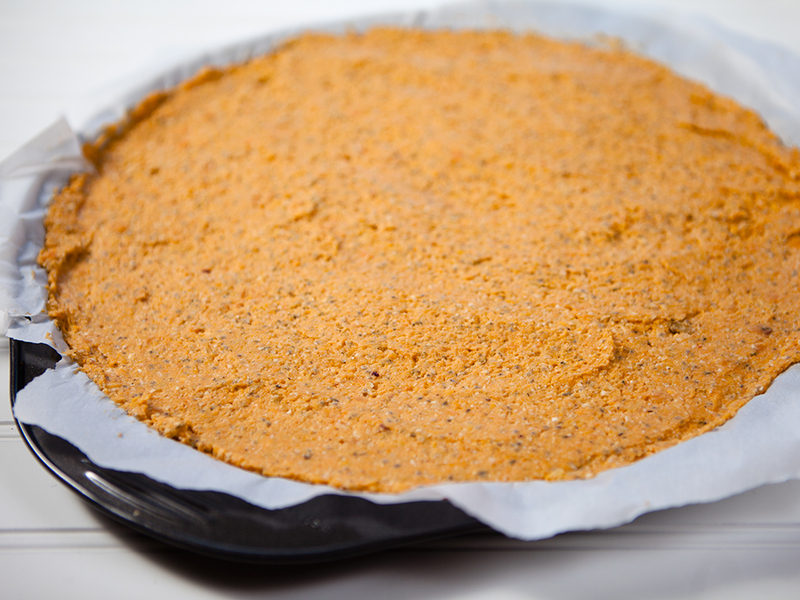 Scoop the sweet potato mixture onto the parchment paper and use a spatula to spread it into a large circle on the pizza pan. 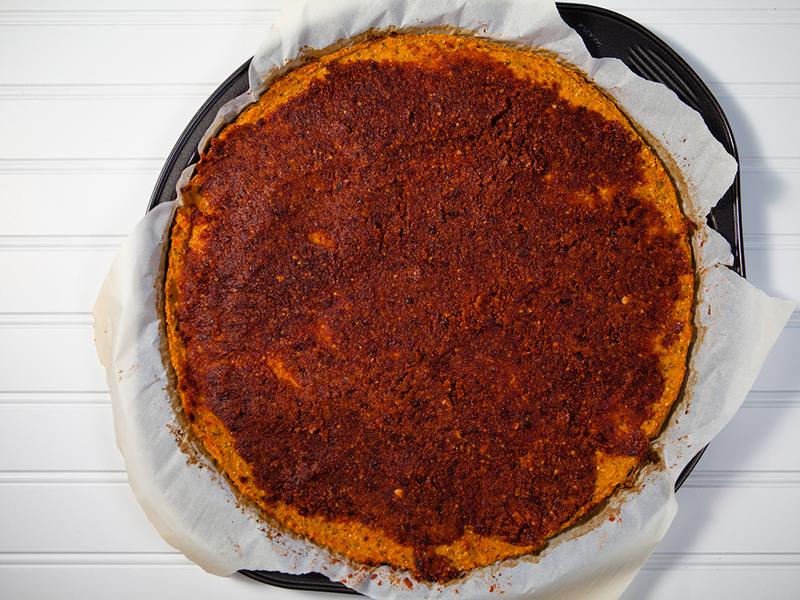 When you're done, you should have a ½-inch thick pizza crust. Pop the pizza pan in the oven and bake for 40 minutes or until the crust is set and the edges are golden brown. 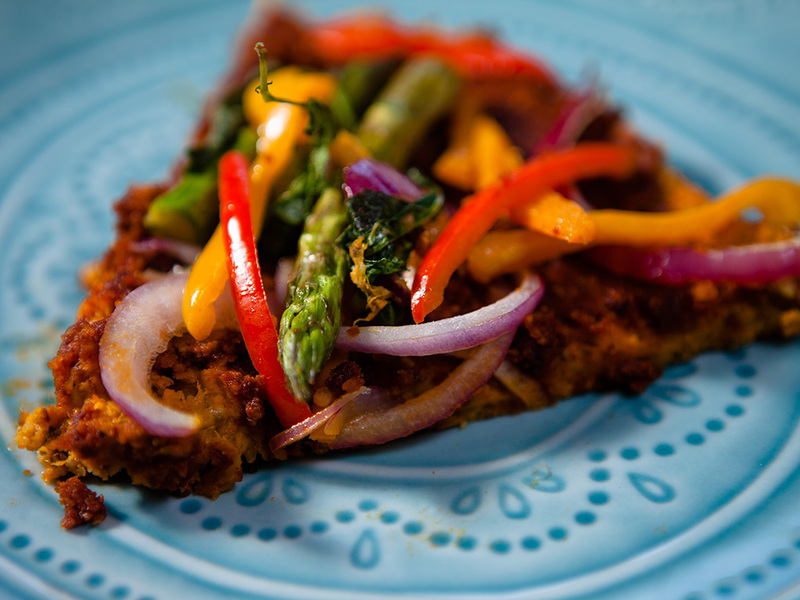 Spread pesto over sweet potato crust. Toss asparagus and kale in olive oil. 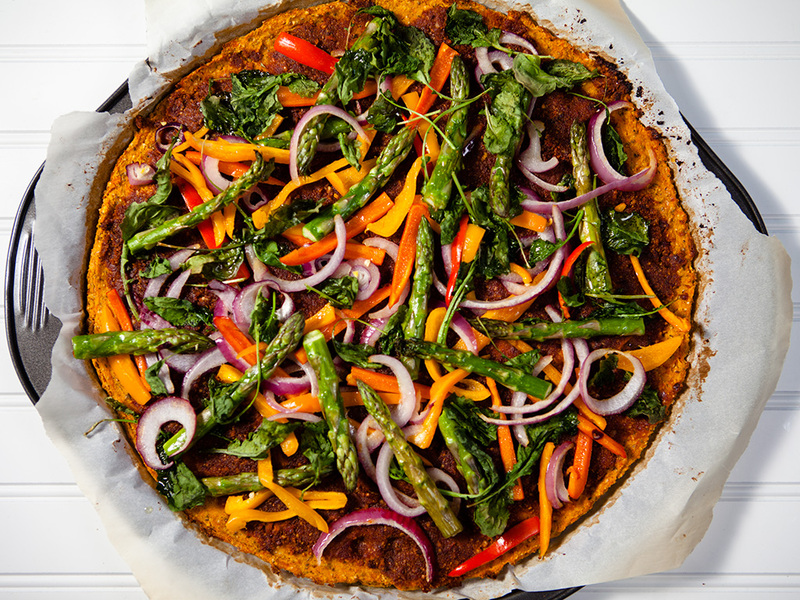 Top pizza with asparagus, red onion, peppers and kale. Return pizza to oven for 10 minutes.